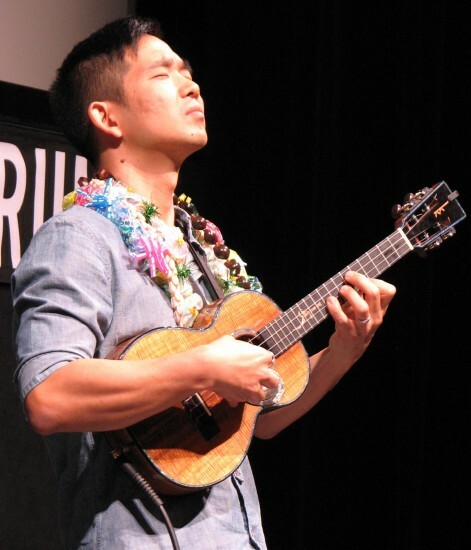 Ukulele virtuoso Jake Shimabukuro and filmmaker Tad Nakamura worked on the documentary “Jake Shimabukuro: Life on Four Strings” for three years, becoming friends and learning a lot from each other in the process. The award-winning film, completed in 2012, follows Shimabukuro on tour across the U.S. and Japan, and also looks at his family life. Interviewees include his mother, Carol, who began teaching him ukulele when he was 4. 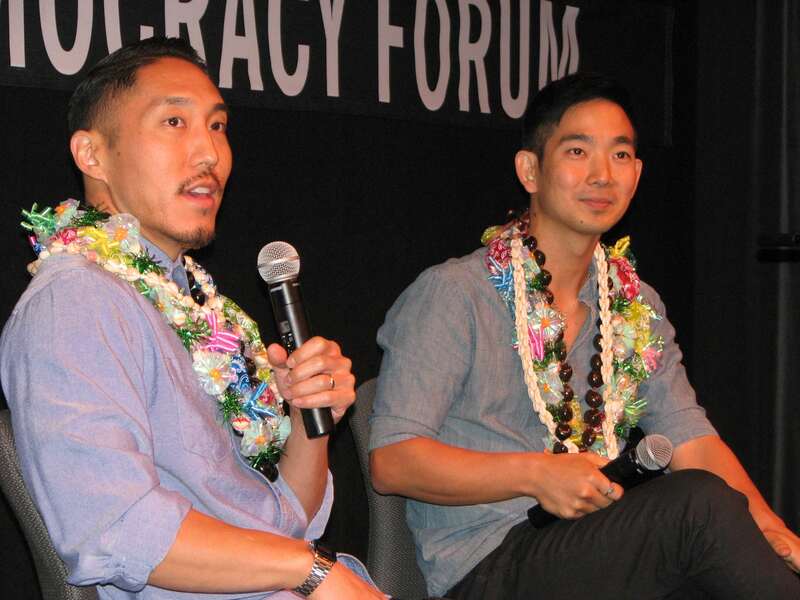 A Dec. 21 event at the Japanese American National Museum’s Tateuchi Democracy Forum provided a rare opportunity to see the film, listen to a Q&A with Shimabukuro and Nakamura (only their second joint appearance at a screening), and enjoy a mini-concert. The event was co-presented by JANM, Angry Asian Man, First Pond Entertainment, and Visual Communications. Nakamura noted that the venue had special significance because his documentary “Pilgrimage” (2006) was screened there and a scene from “Life on Four Strings” was shot there during the Asian American Music Festival in 2010. Also known for “Yellow Brotherhood” (2003) and “A Song for Ourselves” (2009), Nakamura was joined by his parents, filmmakers/documentarians Robert Nakamura and Karen Ishizuka, and other family members. The elder Nakamura directed some of the earliest films by and about Asian Americans, including “Manzanar” (1971). Shimabukuro, whose wife, physician Kelly Yamasato, was pregnant in the film, reported, “My son, he’s two years and four months now, and his name is Chase. I wish I didn’t name him that because he truly lives up to his name. It’s been great. The project started when Young saw one of Shimabukuro’s videos on YouTube but couldn’t find much background information on the Internet. “It piqued his curiosity, so he had this idea to make this film … I was very honored because no one had ever approached me and no one had ever wanted to do a film on me before — and no one has since,” Shimabukuro recalled. “That was about a $5,000 manini,” Nakamura joked. The film also takes Shimabukuro back to New York’s Central Park, where he played George Harrison’s “While My Guitar Gently Weeps” in 2006. A video of that solo performance went viral on YouTube, getting more than 13 million views to date and launching his career into high gear. The crew visited the Tohoku region of Japan after the devastating 2011 tsunami, including Sendai, hometown of Shimabukuro’s manager at the time, Kazusa Flanagan. “I was just hoping to bring some aloha, bring some music to the people there,” Shimabukuro said. “It was very encouraging because when we went to visit some of the shelters, especially the kids, you would see them just light up when you hand them a ukulele and they strum something. “You were not looking good before the show, but you absolutely came out and just killed it,” Nakamura told Shimabukuro. Discussing the latter song, Shimabukuro observed, “One of the similarities with Tad and myself … is our relationship with our parents. I think especially being a Japanese American, we always feel this responsibility or we put pressure on ourselves to make our parents proud, because we think of all the sacrifices that not just our parents but our grandparents and our great-grandparents … made so that we could be here living in this country. “Life on Four Strings,” which has been broadcast on PBS, is now available on DVD and via iTunes, Amazon Instant Video and Netflix. For more information, visit www.lifeonfourstrings.com.